With everything on the line, the Denver Outlaws (8-6) secured a playoff spot for the 2018 MLL Playoffs with a nail-biting 15-14 victory over the Atlanta Blaze (7-7) on Saturday night. The Outlaws secure the No. 3 seed in the 2018 MLL Playoffs and will take on the Chesapeake Bayhawks (9-5) on Saturday, August 10 at 3:30 p.m. MDT in Annapolis, Md. Leading the charge for the Outlaws was veteran attackman Eric Law (5 goals) who became only the second player in Outlaws history to score 40 goals in a single season, with Chris Bocklet being the first Outlaw to accomplish this milestone in 2013. The Outlaws also had help from Drew Snider, Zach Currier, and Matt Kavanagh with each tallying two goals and two assists in the victory. Outlaws attackman Kylor Bellistri and midfielder Josh Hawkins each scored two goals to help secure the victory for the Outlaws. Following a 1-1 tie only five minutes into the game, the Outlaws and Blaze were forced into a 90-minute weather delay. Following the delay, the Blaze rattled off a 6-2 scoring run to jump up to a quick 6-3 lead over the Outlaws following the first quarter, but Denver responded with a four-goal scoring run of their own to close the gap and make it 8-7 at halftime. 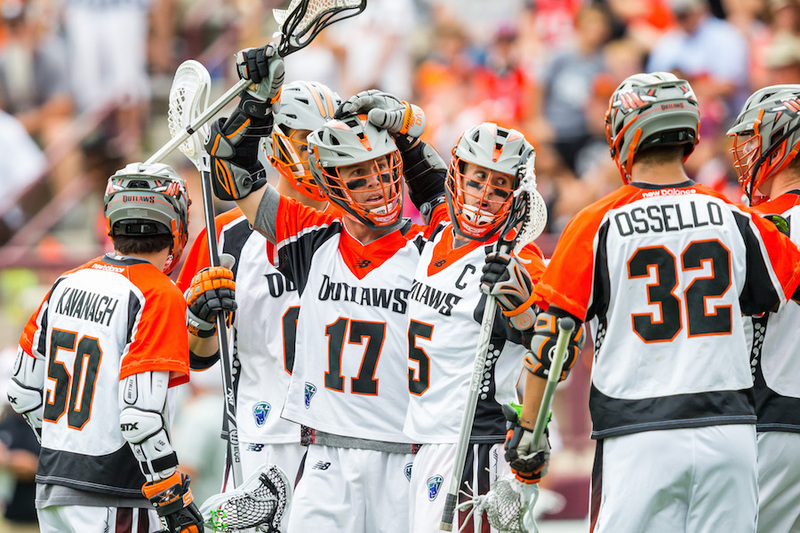 The Outlaws continued where they left off in the second quarter by going on another four-goal scoring run, that started with two straight goals from Outlaws veteran attackman Matt Kavanagh. Following a strong scoring run to open the third quarter, the Outlaws’ defense came up large by holding the Blaze to only one goal in the third quarter, while the Outlaws tallied two more goals to close out the third quarter with a 13-9 lead. Opening the fourth quarter, Atlanta tallied a four-goal scoring run to close the gap before Outlaws attackman Eric Law notched two goals of his own to extend the Outlaws lead. Despite the Blaze scoring two more goals in the final few minutes of the fourth quarter, the Outlaws ultimately would hold on to escape with the 15-14 victory, and clinch the final playoff spot for the 2018 MLL Playoffs.